Space probes have sent us mountains of images and data to pour through, and sometimes we find hidden gems like a volcano or ancient gully on Mars. The first spacecraft to orbit Mars, Mariner 9, sent the first close-up images and data from the Red Planet over forty years ago and changed our perception of Mars forever. We’ll also include some more recent images of Mars throughout the article. If today we are passionate about the quest of Curiosity rover, which has touched down on Martian soil over five years ago, we owe this passion to other interplanetary probes that preceded it. The year 1971 was a highlight in the exploration of Mars and space exploration as a whole. With two on the American side (Mariner 8 and 9) and three on the Soviet side (March 2, March 3, and Kosmos 419), a small flotilla of unmanned space probes set the Red Planet as its destination. Unfortunately, four of the five probes were unsuccessful: Kosmos 419 and Mariner 8 failed to leave Earth, while March 2 and March 3 couldn’t carry on their mission for other reasons. Only Mariner 9, which was an unprecedented success, managed to enter into Mars orbit and send back data that changed our understanding of Mars and unmanned interplanetary missions. The Mariner program was a NASA space program (1962-1973) aimed at sending space probes to study Earth’s three neighboring planets: Mars, Venus, and Mercury. Among the ten probe missions in the Mariner program, seven were successful. While the successful missions dedicated to Mars were only flybys, they still made astounding discoveries. Mariner 8 and 9 were part of the Mariner Mars 71 mission, which was intended as a two-spacecraft mission. After Mariner 8 prematurely crashed into the Atlantic Ocean, Mariner 9 had to fulfill the objectives initially devolved to both of them. Mariner 9 was launched, aboard an Atlas-Centaur rocket, without incident on May 30th, 1971, much to the relief of mission officials. The probe reached Mars after a 167-day trip on November 14th, 1971, becoming the first human-made object to orbit Mars or any other planet. At the ground, after Mariner 9 successfully put itself into orbit, NASA JPL scientists were on tenterhooks, waiting for the first images to flow back, but they were hugely disappointed at first. It was as if Mars didn’t want its intimacy to be disturbed by Earthlings! Mars was enshrouded in what seemed an endless sandstorm of planetary proportions, and images were invisible behind a dense blanket of particulate. Then a couple of months later, in January 1972, the dust literally settled, and the exotic geology of the planet finally appeared. In total, until the end of its mission on Oct. 27th, 1972, Mariner 9 captured and sent back over 7,300 Martian images revealing plateaux, craters, canyons, and more. 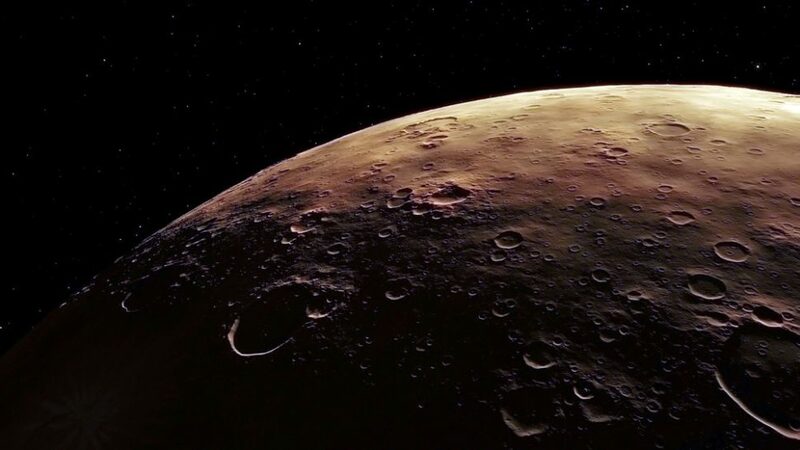 Of the most significant images were those of the 2500-miles-long Valles Marineris canyon that dwarfs the Grand Canyon, the Mars moons (Deimos and Phobos), the largest volcano in the solar system (Martian shield volcano), and the Mariner rift valley, named after the probe that found it. The spacecraft also spotted dried-up river beds, which geologists took as evidence that water once flowed on Mars, findings that were corroborated decades later by Curiosity. Before it ran out of attitude control gas, Mariner 9 mapped over 85% of the Martian surface and helped pave the way for the then incoming Viking landers. Now in areocentric orbit around Mars, Mariner 9 is expected to fall into the planet’s atmosphere by 2022.